It’s important for AWS Partner Network (APN) Partners to register for AWS Training and Certification through APN Partner Central so those achievements count towards your APN tier requirements. Standard-tier and above APN Partners must meet specific requirements for AWS Training and Certification to maintain their APN tier status for years to come. In this post, we outline how to use APN Partner Central to sign up, and to recognize the individuals in your organization who have passed AWS Training courses or achieved an AWS Accreditation or Certification. These best practices for maintaining AWS Training and Certification compliance are part of our “Achieve the Green” series that will help APN Partners get green check marks throughout the Partner Scorecard Review. We strongly encourage individuals to register for AWS Training and Certification through APN Partner Central (login required). This is an exclusive portal for APN Partners (regardless of tier) that provides the tools, content, and resources you need to grow your business on AWS. By registering for training through APN Partner Central, your organization receives credit toward APN tier eligibility and compliance requirements. Employees should make sure all registrations are made using their corporate email address. To register for AWS Training or Certification, log in to APN Partner Central and access the AWS Training and Certification portal via the link at the top of the home page. Figure 1 – Standard-tier and above APN Partners must meet specific requirements for AWS Training and Certification to maintain their APN tier status. 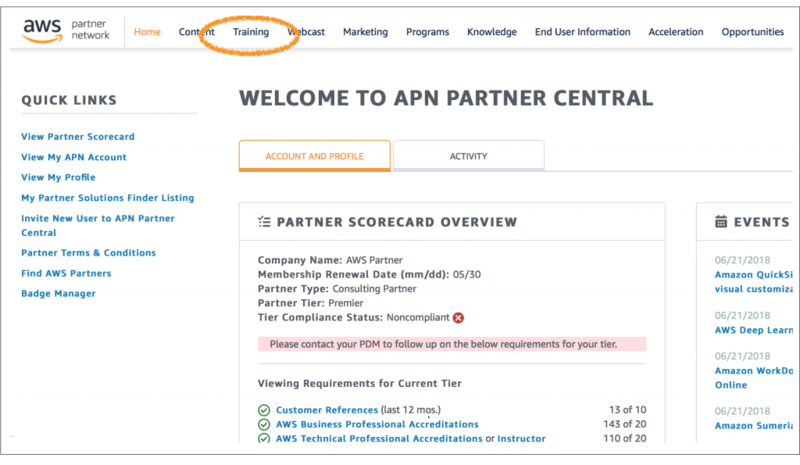 If individuals in your organization do not register for Training and Certification through APN Partner Central, or have already passed AWS Training courses or achieved an AWS Accreditation or Certification, please connect with your APN representative to inquire about next steps. AWS Training and Certification demonstrates technical expertise and helps employees advance their careers. It also helps AWS customers evaluate potential APN Partners to work with, as AWS Trained and Certified individuals show a clear commitment to AWS technology, services, and best practices. APN Consulting and Technology Partners can raise the bar and differentiate their business by hiring AWS Certified individuals at the Professional, Specialty, or Associate level, or by investing in the continued professional development of existing employees. Learn more about the AWS Certification journey, including exam prep resources and benefits. You can also get up-to-date news and info about AWS Training and Certification at aws.training. By staying compliant with APN tier requirements, you maintain the recognition you have earned as an APN Partner, retain access to valuable benefits, and gain eligibility to apply to APN Programs like AWS Competency, AWS Managed Service Provider (MSP), and AWS Service Delivery. Each of these designations help AWS customers identify and choose highly qualified APN Partners from the tens of thousands in the AWS Partner Network.